I swear this tastes AMAZING. I also used Davinci Sugar Free German Chocolate Cake Syrup , Davinci SF French Vanilla Syrup and Walden Farms Pancake Syrup , cinnamon, sweetener and a bit of PGX Granules and Baking Soda. I mixed numerous servings with the syrups, sweetener and microwaved it. 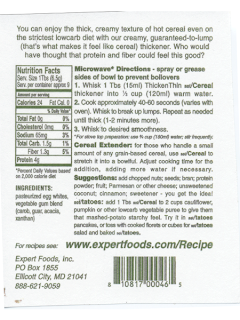 Amazon doesn't have a link to the Expert Foods Wise Choice Cereal Thickener- just the fudge bar mix (you can use that too) so I linked to Dixie Carb Counters Thickener instead. 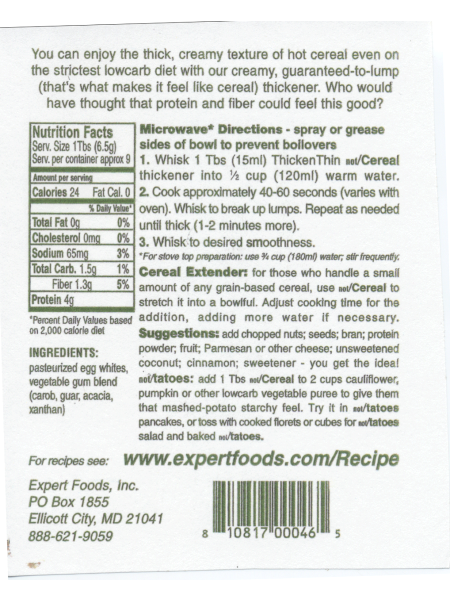 Oohh I need to find out more about this cereal thickener! Can you add it to oats? yes! Anything! I've been using Expert Foods/ Wise Choice for YEARS. They're so interchangable too! The only difference between most of their products are the blends of gums and whether or not they contain egg whites. The Baker's Deluxe/Dixie Diners' products are AMAZING. Seriously. They are all interchangable too! I use the biscuit mix for microwave cakes with Davinci Syrups, or the pizza dough for protein cakes etc. Best orange cran muffin mix EVER! And brownies, cakes etc. Worth checking out!